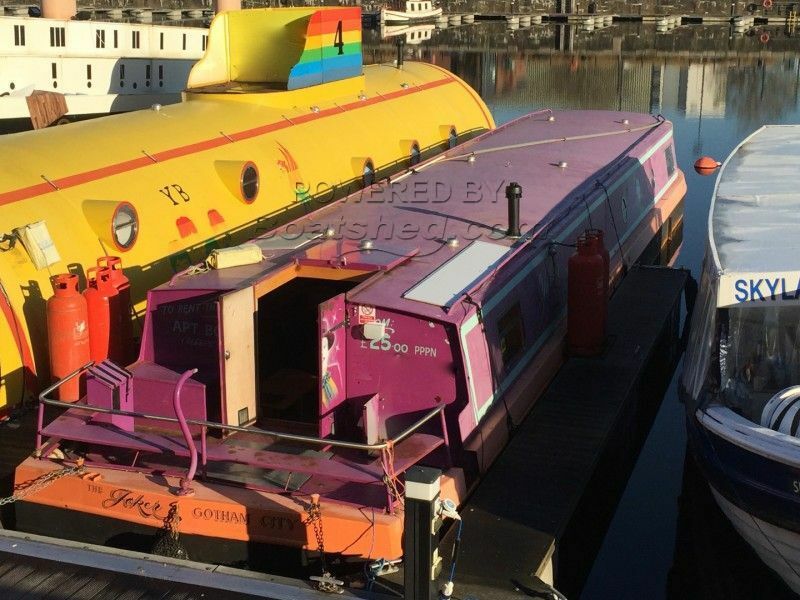 This fab batman boat in the colous of the joker was purpose built in Liverpool and turned it into a 5 star bespoke apartment boat, located right in the heart of the Albert Dock can be transported anywhere in the world. Inside the boat is 42in LED TV , full Sky TV and sport, all central heated, fully fitted Italian kitchen, flat screen TV & DVD with Sky located in the bedrooms. The boat has a twin bedroom, master bedroom at the front and a lovely fitted shower room with heated towel rail. The boat has no engine and uses calor gas for heating and cooking and mains power. There was originally an engine so one could easily be fitted if need be. An engine will be fitted within the price for the new owner. This Wide Beam Apt/Hotel/Liveaboard Viable Business Or Houseboat has been personally photographed and viewed by Paul of Boatshed Lancashire. Click here for contact details.